On July 4, we took a short drive south of town to Ethridge, Tennessee, to Tennessee Amish Country. The farms are clustered along a few roads and at the end of the driveway of each farm you'll find signs with the produce and hand-made items available for sale. Most farms even have a small shed housing their items. It's great fun to visit, shop, and take a few photos. But don't take photos of the Amish, or get caught taking photos of their farms. It's against their religion. 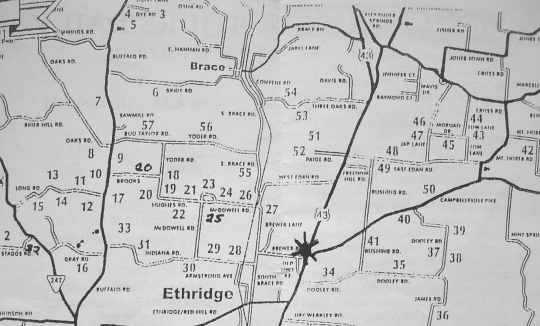 The Ethridge Amish community is the largest in the South. It’s a Swartzentruber Amish settlement founded in the 1940s with about 1,500 Amish living there today. Typical of Swartzentruber settlements, it is a farming community supplemented by small shops full of produce and homemade and handmade items for sale. This map of Amish business locations is found in a brochure distributed by the Amish Welcome Center, located off Highway 43 in the middle of the settlement. It’s pretty useful if you are looking to visit the area’s many Amish vendors. We drove from farm to farm purchasing peanut brittle, pumpkin bread, sorghum, and October beans. October beans of the South can be both tender hulled or tough hulled. Tough hulled ones must be shelled out to be eaten as shelly beans or as dry beans. Tender hulled ones can be cooked and eaten with the hulls still attached to the seeds. I purchased the tough shell variety that had to be shelled. Aren't they beautiful? The remind me of splatterware pots. I boiled them in chicken stock and added onion and garlic. After about 25 minutes I added leftover rice and pork tenderloin medallions, salt and Tabasco, and let it heat for an additional 5 minutes. Cover beans with water and soak overnight; drain. Fill bowl with water again and swirl to loosen any remaing dirt; drain again. Place beans in a 5- or 6-quart slow cooker with water and remaining ingredients except salt and pepper. You may want to dice green pepper or even hot peppers, optional. If you choose to add diced tomatoes, wait until the last hour or so of cooking. Acid items added can toughen the beans if added too soon. Cover cooker and cook on low setting for 9 to 11 hours, OR on high setting for 5-6 hours. Stir a couple of times during cooking and add more water if necessary. Season with salt and pepper right before serving. If you add the salt too early, it will toughen the beans. Consider other seasonings, too: cumin, chili powder, oregano, it's your beans. Serve with cornbread, or over rice, or with ham and biscuits.